I was out sick from work on Tuesday, but despite feeling ill, I did have a nice day with my daughter Ocean. She doesn’t go to school on Tuesdays, so we hung out together, in between my sleeping. 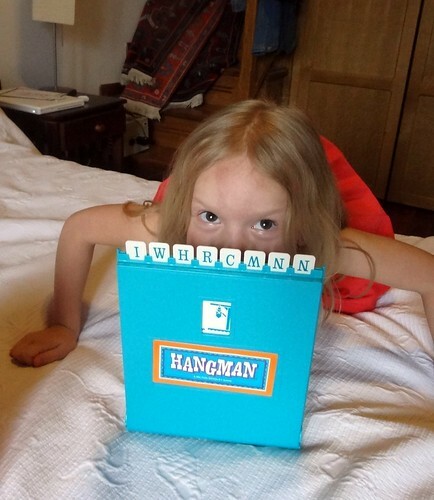 She loves board games and insisted on us playing Hangman. She knows a couple of words, like her name, and Bill, so I thought that is what she would have. I lost and when I asked her to reveal her word, you can see what she put up. I see that she understands the basic format of the game, but not the meaning. Hilarious! How could I get mad at losing with such an adorable little girl like this. We played chutes and ladders, candyland, sequence, creationary, trouble, hangman, and operation. I had a lot of fun! It would be wonderful to be a stay-at-home Dad.